US, 1942, 66 minutes, Black and white. 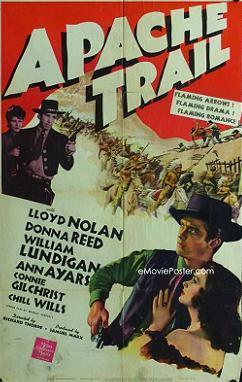 Lloyd Nolan, Donna Reed, William Lundigan, Ann Ayers, Connie Gilchrist, Chill Wills. Apache Trail is a small-budget B-feature. It is a conventional western, focusing on outlaws, the robbing of stagecoaches and payrolls, the innocent man jailed, the Apaches and the warpath, Geronimo, the infiltration of the Indians and robbing them and killing them? The Spaniards at the stagecoach station? The femme fatale and her visit, the artist and his wife, interesting characters – the stagecoach types. Lloyd Nolan is smooth as the outlaw brother, William Lundigan upright as the good brother making a chance by running the station well, encountering the Indians, facing the dilemma of surrendering his brother to Geronimo or not? Donna Reed, in an early role, is a Spanish senorita with eyes for William Lundigan, Connie Gilchrist her mother. Ann Ayers is the widow of an officer who committed suicide and now has her eye on Lundigan. The film was directed by Richard Thorpe, a director of many films at MGM, including a number of action features in the 1950s with Robert Taylor including Quentin Durward, Ivanhoe, Knights of the Round Table. 1. An entertaining western? Regular contents? Treatment? 2. The title, the Apaches, the warpath, the smoke signals, the attack on the fort? Trigger Bill and his infiltration, initiation, killing and robbing? The young Indian wanting to be with the whites at the station, giving his life for the whites? The prejudiced statements about redskins and whites? A film of 1942? 3. The western scenery, black and white photography? Action sequences? 4. Trigger Bill, Tom, brothers, Tom being released, Bill wanting to join him, giving him the money, Tom wanting to go straight, his being entrusted with the station? His running the station well, Rosalia and her mother, persuading him to stay, tidying up, the meals, safety? The colonel and the payroll? The stagecoach, the artist and his wife, the artist’s illness, sketching the Indians, sketching Trigger Bill, his giving him the guns, his collapse and death? His wife and her grief? Constance and her being a widow, her eye on Tom, Rosalia and her reaction? 5. Trigger Bill, coming to the fort, the background with the Apaches, Tom taking his guns, his comments, his getting the guns from the artist, getting the payroll, his wanting to leave, taking Constance? Thinking she was his type? Tom at the gate, taking him back in? 6. Rosalia, her age, from Spain? Attracted to Tom? Working at the fort, jealousy of Constance? Her declaration of love? Her mother, support, work? Urging Rosalia on? 7. Tom and his going to the Indians, routing them, getting the injured man and breaking the arrow, the return? 8. The Indians and the message, the siege? The shootings? Wanting Trigger Bill surrendered? 9. The vote, black for his being handed over, white for staying? The even vote? Bill and his casting vote? 10. Trigger Bill, the touch of conscience, seeing Rosalia? Going out, the Indians pursuing him, killing him? 11. Constance going on? Rosalia and her mother being persuaded to stay, the proposal? The happy ending? 12. The conventional images of westerns, the whites versus the redskins? Prejudices dramatised?